The Singer One is a Full-Size machine, built with easy to use Computerised / Programmable features. The Singer One has a total of 24 different types of stitches, including 2 buttonhole stitches. This model is also known as the Singer 1. Is the Singer One right for my skill level? We class the Singer One as “Beginner“, meaning that this machine has features that are suitable for a sewer working at a Beginner skill level. In general, machines that are classed as "Beginner" tend to have all of the features that we think a beginner will need to be able to learn how to sew. Beginner machines may also have some features that need to be manually adjusted, so that new sewers can learn how the machine works and learn how to handle their machine on different fabrics. What size is the Singer One ? We class the Singer One as a Full-Size machine. Standard or full-size machines are the most versatile machine size as they work for a range of sewing applications. Full-size machines are usually wider than compact machines and this gives you slightly more space to manoeuvre the fabric around the needle area. The Singer One is also wider on the left side of the needle area than many machines and this gives you a larger workspace as well. The width / length / height dimensions of the Singer One are 58.4cm x 25.4cm x 33cm. Or in inches 23” x 10” x 13“. The Singer One weighs approximately 8.4kg or 18.5lb. Basic sewing features on the Singer One ? The Singer One has basic features such as a Free Arm with Removable Cover, Standard Foot Pedal, No Start / Stop Button and an LED lighting provides illumination of the area around the needle. Reverse stitches, used for securing the thread in the fabric at the beginning and end of a stitching line, are created with a Reverse Button. Threading and setting up the bobbin for the Singer One? When setting up and threading the sewing machine, the Singer One has a Drop-in bobbin for quick rethreading of your machine. There are No Special Guides for Threading on this model, but the threading process is simplified with just a single channel down the front of the machine. The needle threading is Automatic / Assisted. Sewers who struggle to see how to thread the needle may also benefit from the automatic needle threader on this model, which is a small inbuilt device that swings around and helps you to hook the thread through the eye of the needle. What presser feet are compatible with the Singer One ? We believe the Singer One is compatible with presser feet that are Press On / Low Shank. If you already have presser feet that are compatible with this type of shank from a previous sewing machine, then in many cases you will be able to use the same presser feet on this model as well. To be sure that presser feet can be used on different machines, or when buying new presser feet and other parts and accessories, you should always check that the parts are compatible with your specific machine number. So for this machine you will need parts and accessories compatible with make and model Singer One. What are the basic stitch types for the Singer One ? Stitch types on the Singer One include: Straight Stitch, Buttonhole, Decorative, Zigzag. The buttonhole process is a 1 Step Buttonhole. 1 step buttonholes are automated and easy to use for beginners. Can I adjust the stitch width and length on the Singer One? On the Singer One, the maximum stitch length is 3mm, and the maximum stitch width is 7mm. The stitch length on this model is adjusted with an Adjustable / Manual Control. When a machine has adjustable stitch length you can manually adjust the length of the stitches to create different effects and alter the appearance of the inbuilt stitches. The stitch width on this machine is adjusted with an Adjustable / Manual Control. Adjustable stitch width allows you to manually widen your stitches, which can be particularly helpful for customising zigzag stitches. What fabrics can I sew with the Singer One? The Singer One is listed as being Suitable for a range of different fabric weights, from silk to denim. On many machines, these results will only be achieved with the correct needle and thread combination, so specialty needles and threads may need to be purchased separately and may not be supplied with your machine. You should consult the manual for your machine to ensure that the machine is set up correctly when sewing different fabrics, and always sew test samples to get the best possible stitch quality and to achieve perfectly balanced tension. Can I adjust the thread tension and the presser foot pressure on the Singer One? To help you achieve the best possible stitch quality across different fabrics the Singer One adjusts the tension of the upper thread using an Automatically or Manually Adjusted Control. The thread tension can be set to automatic so that the thread tension will be automatically adjusted by the machine to suit different fabrics, or you can adjust the tension yourself manually for full control. The Singer One also adjusts the presser foot pressure using an control. This means that the presser foot pressure is automatically adjusted by the machine to suit different fabrics. If you prefer complete control over the pressure of the presser foot then you will need a machine with manual / adjustable presser foot tension. Does the Singer One have any automated features? This model has no special automated controls. For example, this model does not have automated controls for the needle stop position, automated back tacks or automated thread trimming. If automated controls are important to you then you might like to consider a machine classed as Competent, Advanced or Professional. To help you neaten fancier stitches without a messy back tack, Locking stitches are created one on top of the other with a push of a button to neaten off decorative stitches. What is the voltage of the Singer One? 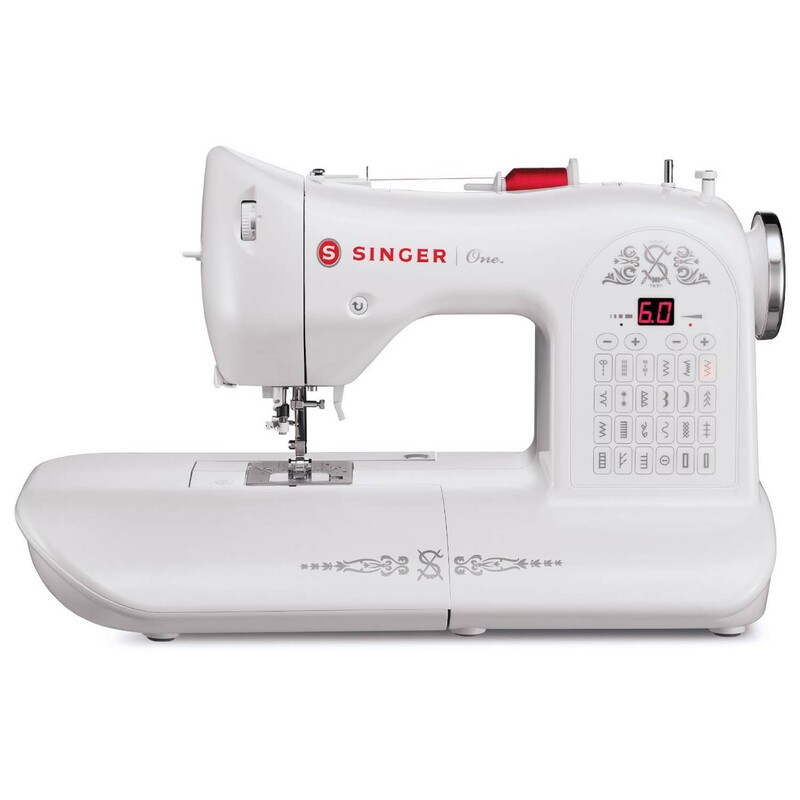 With a voltage of 110v we believe this machine is suitable to use in the USA, but it is always best to consult the information provided by the manufacturer (Singer) or consult a sewing machine distributor prior to purchase to ensure that the machine will work in your region if you are unsure. Most manufacturers do not recommend using adaptors to convert the voltage of your machine for safety reasons. I need a copy of the manual for the Singer One ? Whether you are having trouble threading your machine, can’t work out how to change the stitch settings or just want to make sure you’re getting the most out of your sewing machine it is always best to have a copy of the manual on hand. The Sewing Machine Directory is an Amazon Affiliate. To find out more, please visit our About Us page.